Back for a second time at The Crazy Coqs is Steve March-Tormé with his exciting show SNAP, SIZZLE AND POP!, full of finger-snapping jazz standards and enduring pop tunes presented in a captivating, charismatic style by a singer whose extraordinary and intoxicating voice both smoulders and electrifies. Steve will be accompanied by his jazz trio and will be singing a mix of classic standards such as Blue Moon, I Only Have Eyes for You, The Folks Who Live on the Hill and Glory of Love as well as a number of his original compositions. His profound lyrics and seductive vocals together with stories about his personal life are always guaranteed to hold a crowd and excite emotions. 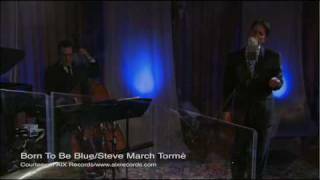 Steve March-Tormé, son of the legendary and multi-talented "velvet fog" Mel Tormé, performs and woos audiences from intimate jazz clubs to festivals and performing arts centres worldwide.